← Week in review, and… I am going for the Long Run. As I sit to write this, I am incredibly proud of myself. 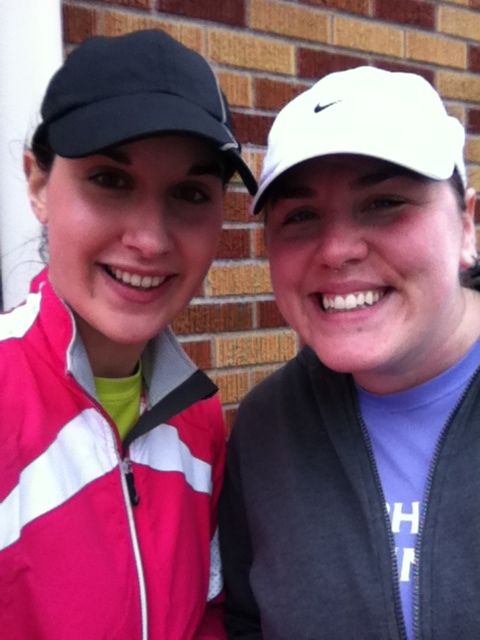 I woke up today, drove out to the middle of the county with my running buddy, and I ran the half marathon. I finished in under 2:20, which was my goal for the Whidbey Island half next month. This means I want to finish Whidbey Island under 2:15! Today’s race was boring, lacked any sort of fanfare, and did not end with a medal, a tshirt, or even a goody bag. Yep, I ran a half marathon without any of the tangible perks at the end. This represents a huge shift in why I am running. I realize it is no longer about “hey look, I can prove I did this… aren’t YOU proud?!? !” and it’s become about me knowing I laced up my shoes and delivered on my own promises to myself. And knowing I met that goal–running those 13 miles is good enough for me. Now the specifics. I started out and told my running buddy (who was running the 4 mile distance) as we inched to the start that I could always change my mind and run the 4 mile distance if I wasn’t feeling the half partway through the race. In fact, I was still indecisive about whether or not I was actually doing this thing until around 2 miles when the half route and the 4 mile route split ways at a fork in the road. I turned right–I committed to the whole enchilada. Once I made that turn, the run really began for me. I ran in anticipation of the 6 mile marker; when I run half marathons, I always visualize the distance as four 5Ks and totally ignore the last mile until I get there. So with this adjusted math, 6 miles is my halfway point. I snacked on some GU and took advantage of the fairly few water/gatorade tables. Beginning at around Mile 9, the course was winding through completely barren manure-coated fields, and the wind was against me. The combination of wind and monotony and stench made for a difficult final 5K. At Mile 11, I truly hit a wall. Even the manure looked like an okay place to curl up and be still! Mile 11-12 was a true challenge for me; I was scraping the bottom of my mental reserves. When I saw the Mile 12 marker, I knew I had this one. I ran without losing pace and looked straight ahead, toward the horizon, toward the finish. My running buddy joined me about 2 blocks from the finish line and ran alongside me. It was just the pick-up I needed. I saw the clock at the finish and sprinted to the end. I was done and achieved a new PR for my half marathon. Whew! Very different experience from the other half marathons, but I could feel throughout how much stronger and steadier I am as a runner. Even in comparison to the Seattle Half in November, I had a much easier time digesting this distance and keeping a steady pace. I am glad I decided to go for the 13 miles, even if I waited until the last minute (or the last fork in the road) to commit! I am definitely excited for the Whidbey Island half next month! I’m surprised there was no medal or goody bags or anything. The medal makes it fun! hmm!